From two-time Newbery Medalist Kate DiCamillo comes a story of discovering who you are — and deciding who you want to be. Called “one of DiCamillo’s most singular and arresting creations” by The New York Times Book Review, the heartbreakingly irresistible Louisiana Elefante was introduced to readers in Raymie Nightingale — and now, with humor and tenderness, Kate DiCamillo returns to tell her story. Kate DiCamillo is one of America’s most beloved storytellers. She is a former National Ambassador for Young People’s Literature and a two-time winner of the Newbery Medal, for The Tale of Despereaux and Flora & Ulysses. Born in Philadelphia, she grew up in Florida and now lives in Minneapolis, where she faithfully writes two pages a day, five days a week. Louisiana, with her quick, insightful takes on everyone she meets, grabbed readers’ hearts in ‘Raymie Nightingale,’ and in this book she isn’t about to let go. Though her life has been filled with hardship and uncertainty — and there are more painful secrets to come — she continues to operate with a sense of wonder and practical optimism (the pages shine with it). DiCamillo offers a master class in how to tell and shape a story once all fat has been cut away. Though set in the mid-1970s, there’s fairy-tale quality to this, with heroes, helpers, villains, and one princess looking for home. Readers who first encountered Louisiana in Raymie Nightingale (2016) will be heartened to learn more about her...For readers who relish thoughtfully constructed plots, well-developed characters, and carefully crafted language, this will be a special treat. DiCamillo builds a resilient and sympathetic character in Louisiana, and the juxtaposition of her down-to-earth observations with Granny’s capriciousness lightens the narrative and allows for a good deal of humor...The overarching themes addressing forgiveness, love, friendship, acceptance, home, and family (“Perhaps what matters when all is said and done is not who puts us down but who picks us up”) ring honest and true. Populated with unforgettable characters, including kindhearted adults who recognize Louisiana’s dire situation and offer options, this bittersweet novel shows a deep understanding of children’s emotions and celebrates their resiliency. Readers will feel as much empathy for Louisiana as they did for her friend Raymie. DiCamillo is able to address complex topics in an accessible and ultimately hopeful way. There is never sadness without comfort, fear without consolation. Louisiana’s soul-searching is no exception and further solidifies DiCamillo’s reputation as a skilled storyteller who trusts her readers to wrestle with hard things. A thoughtful and finely written story that earns its place among DiCamillo’s other beloved novels. The tale is...gently told, as much fairy tale as realistic story, in language that’s lovely in its plainspoken illuminations, with the focus on Louisiana’s longing for connection and observations about the people she encounters on the road and in the small 1970s Georgia town. 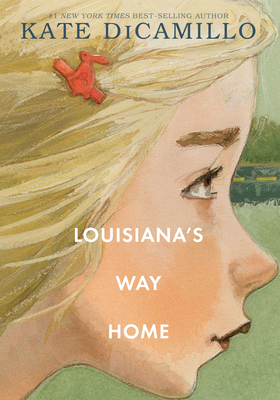 Ultimately this is a deeply sweet but not saccharine take on the old story of an orphan child lost and found, and readers won’t have to know the first book to bond with Louisiana and wish fervently for her to find a home. DiCamillo's funny and hugely likable Louisiana has a marvelous way with words and a spirit that will not rest until she finds her way home, wherever that may be…Louisiana, one of the trio of friends from Kate DiCamillo's Raymie Nightingale, returns in her own beautiful, bittersweet middle-grade stand-alone about finding her home... and herself. In this funny yet philosophical melodrama, 12-year old Louisiana Elefante recalls her identity crisis, forced when eccentric Granny claims “a date with destiny. "...Disparate elements miraculously mesh — stars, smiles, magic, bologna sandwiches, a pet crow and cakes. Here, a two-time Newbery award winner brilliantly guides the dear Louisiana through lies, secrets, anger and abandonment and toward understanding, belonging, gratitude and forgiveness. Almost effortlessly, DiCamillo explores some of the biggest, most important questions of life — What is home? What is family? Who decides what kind of person we get to be? — in this deceivingly simple and profoundly moving novel. DiCamillo peoples her tale with colorful, unforgettable characters, although brave,thoughtful, kind Louisiana is the most memorable of all. Young as she is, Louisiana knows to appreciate rare moments of grace and kindness ("there is goodness in many hearts": the gas station clerk who gives her free bags of peanuts, a woman in the dentist's waiting room who gives her a tin of chocolate chip cookies), and she understands the healing power of forgiveness. This poignant story of loss echoes with themes of hope and redemption. DiCamillo's genius is finding comedy in tragedy, humanity in darkness. Here, the spirited Louisiana Elefante meets loss head on and finds a way home. In Kate DiCamillo’s beautiful follow-up to Raymie Nightingale, Louisiana Elefante is back...The book strikes a delicate balance between relating a charming, entertaining story full of colorful characters and imparting a deeply meaningful life lesson about deciding what kind of person to be. DiCamillo reveals the strength and fight in Louisiana...once again Louisiana finds just the right people to help ground her. This is a marvelous book, full of heart but without a drop of cheap sentimentality. . . . What a pleasure it is to read a story in which the author’s faith in the goodness of ‘average’ people is set forth with such vigor and confidence. This celebration of kindness is itself a kindness to the reader and an encouragement to hope. I really really like Louisiana’s Way Home, a slim, handsome novel about grace. I will read anything Kate DiCamillo writes; the two-time Newbery medalist never disappoints with her stories for younger readers. Her latest finely-crafted tale follows 12-year-old Louisiana Elefante through an unforgettable fable about grace, hardships and discovery. It’s hard to imagine this story being told in any other way than through the words and unique viewpoint of Louisiana herself. The characters wouldn’t come to life in the same way, the setting would be ordinary, and the plot might not be compelling.